The combination of figs, cassis and chocolate is one that's made in heaven. 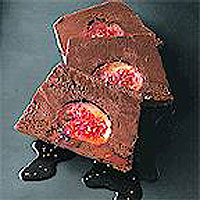 Here, a confection of figs is poached in cassis and sandwiched between two layers of truffle mixture - to make my husband's favourite choc pud. At this time of the year, try the fat black Brazilian figs that are available in Waitrose. You can also omit the figs altogether - the truffle will still be a serious contender for 'best chocolate pudding of the year'. It is great with all sorts of fruit, custards and ice creams. Preparation time: 1 hour, plus 4 hours chilling. Pour the cassis into a saucepan large enough to hold the figs in a single layer. Add the sugar and stir to dissolve. Add the figs and, if necessary, just enough water to cover the fruit. Bring to the boil, then reduce the heat and poach gently for 5-7 minutes, depending on the ripeness of the figs, until tender. Remove the figs carefully with a slotted spoon and set aside. Boil the poaching liquid rapidly until reduced to 3-4 tbsp. Remove from the heat and allow to cool. Melt the chocolate using a bain marie or double boiler until just melted. Allow to cool to blood temperature (if you test with your finger, it should feel neither hot nor cold; if using a thermometer, 35-38°C). Add the reserved syrup to the cream and whip until just slightly thickened. It is important that the cream is at room temperature and that you do not overwhip - it should begin to thicken but not leave a trail. Gently fold the cream into the melted chocolate just until evenly blended. Line a 2 litre (23 x 11 x 6.5cm) loaf tin with clingfilm, then spoon in half the mixture. Insert the figs into the chocolate cream, keeping the tips facing towards the base of the tin. Carefully spoon the remaining chocolate mixture over the figs, taking care not to dislodge them. Cover and place the truffle in the fridge for at least 4 hours, until it is well set. To serve, turn out on to a large flat dish and cut into slices with a sharp warm knife. Serve with Hot Fudge Sauce (see recipe). Make sure the cream is at room temperature. If it is too cold, it will 'set' the chocolate as soon as they make contact and the mixture will go grainy. If it is too warm, the chocolate won't set properly. The chocolate must be about 35°C (within a degree or two) when it is mixed with the cream. Again, if it is too cold it won't blend properly, and if it is too hot, it won't set.